Before meeting Niekro, fans shared their memories of seeing him play. The fans showed up with Phil Niekro baseball cards, unused baseballs, Atlanta Braves hats, baseball bats, photos and memorabilia for Phil to sign. 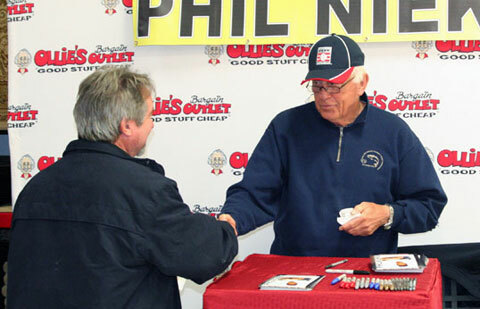 Even Coweta County Sheriff Mike Yeager was among many of the fans who visited Ollie’s Bargain OutleT to meet the legendary Niekro. Phil Niekro, is a former MLB pitcher for the Atlanta Braves and member of the Baseball Hall of Fame. With 318 career victories, Niekro is the most successful knuckleball pitcher of all time. He was also an excellent fielder, winning the National League Gold Glove Award five times. Playing Field Promotions is a booking agent for motivational sports speakers and celebrities. If you would like to book baseball legends or pro athletes like Phil Niekro for a speaking engagement, autograph signing, guest appearance, fundraiser or corporate event, contact Phil Niekro’s booking agent for appearance and speaker fees or call 1.800.966.1380.